Village people can always find a temple, a large yard or open square inside their village. One family would propose that a fund for martial arts be set up. All other families would contribute tuition or food to that fund. Some visiting martial art sifu or neighborhood sifu would then be engaged to train the village’s young men and children. No doubt some of these coaches were good but most were big talkers, perhaps more skilled at self-promotion than their martial arts. The style and lineage of the art they taught were not very clear and even their level of skill was not obvious to the village people. It’s also possible a visiting teacher would challenge the village coach to an open competition. If the current coach were defeated, the winner would take over his position and continue the villagers’ training. Some coaches were only expert in a limited amount of skills and left after teaching all that they knew. Some had broader expertise and thus stayed longer, even settling down in the village. There was no curriculum or pre-determined strategy for delivering this type of training. All students of different levels mixed together and learned whatever the coaches taught. However, the goal of their martial arts training was to protect the village from attacks by bandits or robbers. Most people practiced hard with a serious mind. In addition to the regular martial training, some students might even learn the customized folk dancing. The dragon and lion dances performed at New Year’s and other festivals were mixed with a martial arts movement and foundation. Unfortunately, Sifu Han had forgotten most of the martial arts technique he learned in his early years. He only recalled that at night, carrying a torch, he walked to the training by himself doing the “xing bu” for miles, and with the same torch, returned home after class doing the “short person walk”. (Note: For the “short person walk,” both knees must be continually bent so that your height is kept lower throughout the walk.) What a great and diligent student Sifu Han was! Sifu Han recalled that he met Sifu Shen Mo-Lin by accident at Qing Dao city. Sifu Shen, a professional martial artist of stalwart build and great talent, demonstrated a tornado jump kick and his legs swept over everyone’s head. Sifu Han was stunned and attracted by Shen’s great skill. He then began his martial training under Shen and made a full commitment to the art. It is said that Sifu Shen’s technique was from the Mei Hua chang quan system that originated from Liang Mountain. A few years later, Master Shen left Qing Dao, no longer able to continue teaching. He was very impressed by Han’s talent and willingness to work very hard. He then referred Han to his good friend, Jiang Ben He, to continue his training. Sifu Jiang used to travel to Northeast China and stayed in Dai Lian city. In a street fight with a Russian, Jiang seriously injured his opponent with his staff and was subsequently arrested by the local police. His younger brother visited him in prison and exchanged clothing with Jiang to help him escape. The local police were furious after the younger brother confessed and proved his identity to them. Later on, the police let him go. 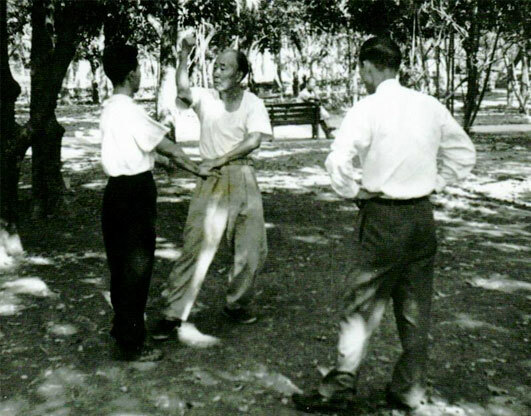 Years later, Sifu Han went to Jinan city, where he learned the Jiao Men chang quan style of long fist from Sifu Zhang Bing-Chang. While there, he met An Zi-Bo, who became one of his best friends. I called him “Uncle Sifu.” Later, the government founded the Central Chinese Martial Art Institute, also known as “Chung Yiang Guo Shu Guang,” in Nan Jing and opened its doors for enrolment. Sifus Han and An decided to join the institute and so they went to Nan Jing together. Han recalled that admission to the institute depended upon passing a test of skill: an open match with the institute’s instructor. If the candidate passed the test, he would be questioned about his martial art style and lineage, and then asked to perform bare-hand or weapon forms. Sifu Han, with a young man’s fearless courage, defeated the institute’s instructor, shocking all the people in the arena. He was admitted right away without being asked to reveal his lineage or perform any form.Uncle Sifu An was also admitted, after he passed the test and performed a form. The institute was just founded and still in its early stages. Every student who joined the institute possessed strong skills and solid backgrounds. Since everyone majored in martial arts, it was quite natural that they exchanged styles and learned from each other. Some students might even have tried to copy some forms from the instructor secretly, without permission. 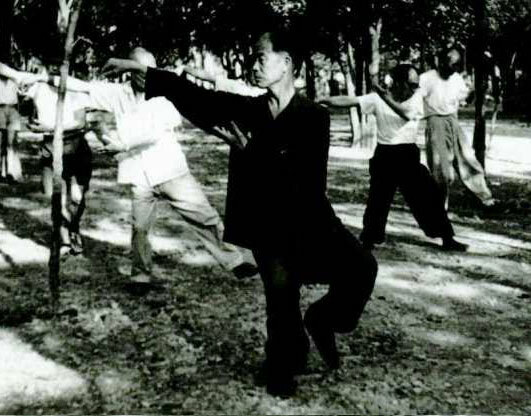 Regarding the curriculum, in the beginning the Institute listed some required courses such as “Lian Bu Quan,” and “San Cai Jian.” Later, other required courses were added, such as “Baji Quan,” and “Qing Ping Jian.” Sifu Han’s main focus in the institute was on long fist and its enhancement. 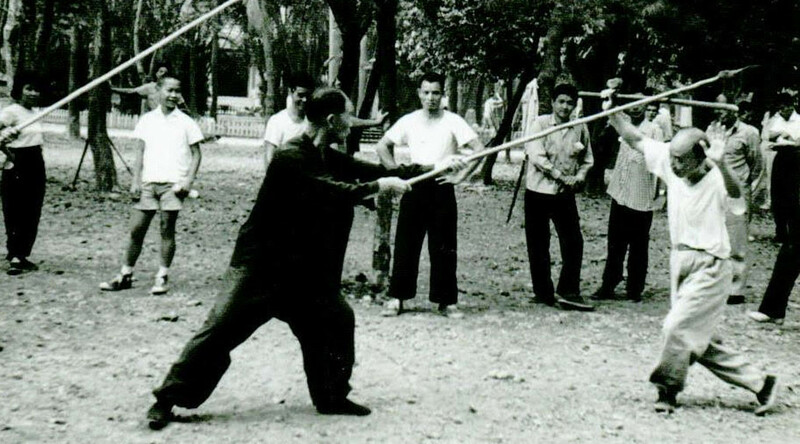 He also spent some effort on Xing Yi Quan and Tai Ji Quan, which were interesting to most female students and largely ignored by male students at that time. On the weapons side, Sifu Han learned a variety of weapons and their forms. After a time, Sifu Han also spent great effort in studying Shuai Jiao (Chinese Wrestling) and conducted a lot of research, contributing his own innovations into various Chin Na (seizing and locking) techniques. The Hang Zhou Exhibition included a Martial Arts Fair that provided an arena for an open martial arts competition. Sifu Han, some members of the faculty and other students from the institute also participated in this big martial arts event. Sifu Han won his preliminary matches easily and rose through the ranks to the semi-finals. Unfortunately, his next contender was a faculty member from the institute – Wang Zi Qian. Sifu Han conceded the match, and so disqualified himself from the Superior Award. Sifu Han won his remaining contests and was ranked as number one in the Excellent Award Group – the Superior Award was offered to six people, only. One early morning, General Zhang Chi Jiang, director of the institute, came by for inspection and saw Han practicing alone in a large field with sweat streaming down his back. Han cast a spear into the sky, waited until it started to fall, aligned the top of his head with the point of the falling spear and then captured the spear just in time. This is a very dangerous movement. Any miscalculation in timing would result in either death or serious injury. General Zhang kept on asking Han, “Why did you do this?” Han replied, “I donâ? ?t mind!” Later, because they began to promote martial arts all over China with the resulting increase in demand for coaches, the institute held its first graduation test. Five students passed and Sifu Han was ranked Number One. Uncle Sifu An was ranked Number Two. Sifu Han was hired by the Hang Zhou Police Academy as their martial arts coach. He met Zhao Wen Long at the academy. In addition to his regular classes, Sifu Han also taught along the banks of Lake Si and these classes attracted many students. Jiang Yu Kun and his sister both trained together under Sifu Han. Mr. Jiang was addicted to martial arts all his life and had lots of students too. Before his death, he used to request that his friends in the U.S. and Taiwan ask for information about Sifu Han. He published a book, “Tai Chi Jian.” In the preface, he talked about the favors and grace he received from Sifu Han. © Copyright 2008 Adam Chi Hsu. All rights reserved.